Chief of the Gorkha Jan Mukti Morcha (GJMM) and the Gorkhaland Territorial Administration (GTA) Bimal Gurung on Wednesday said his party will re-launch the Gorkhaland agitation from 2 October. Addressing a mammoth rally at the Mela Ground here, he, however, said the statehood agitation this time around will be more "Delhi-centric and democratic." 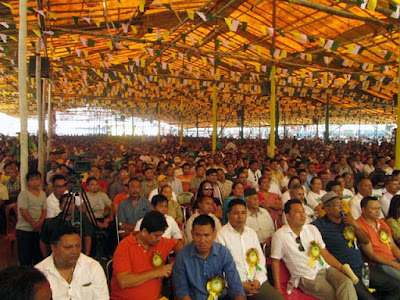 Thousands of GJMM supporters reached here on Wednesday for the public meeting seen as the GJMM's show of strength after Kalimpong MLA Harka Bahadur Chettri severed ties with the party recently, along with Darjeeling MLA Trilok Dewan, who left the party and also resigned as the assembly member. Traffic jam was the order of the day here on Wednesday as thousands of supporters came in from the Hills and the Terai to attend the rally organised by the youth wing of the GJMM. "Timi malai aawaz deu, ma timi lai Gorkhaland dinchu - Bimal Gurung ..." (Lend me your voices and I will give you Gorkhaland) read festoons and posters all along the roads leading to Kalimpong town on Wednesday. Addressing the rally, Gurung said: "We will surely realise our dream of Gorkhaland one fine day." He further said he has no relations with chief minister Mamata Banerjee. "She believes in the divideand-rule policy," he said, adding that the GJMM will now work with the Centre and the prime minister directly. "Since the formation of the GTA, Mamata did nothing. She used to say she will turn Darjeeling into Switzerland, but she made the Hills a murdaland," he said. "Why was there a need for her to visit Darjeeling and launch a clean and green Darjeeling campaign? We (GTA) had been organising such campaigns under the PM's Swachha Bharat Abhiyan," he said, referring to Banerjee's recent visit to Darjeeling and the launch of the cleanliness campaign there. According to him Trilok Dewan and Harka Chettri are not the real betrayers. "It was Didi who went after them," he alleged. According to him, the GJMM's 'Naari Morcha' will organise a "grand rally" in Kurseong on the day the GTA celebrates its anniversary on 7 October. He said awareness rallies on Gorkhaland will be held every Thursday in villages, while Yuva Morcha leaders said they will soon write graffiti for the Gorkhaland agitation. Gurung also said the Delhi-centric programmes for Gorkhaland will heighten during the winter session of parliament. The party has also planned a huge rally in the plains of Siliguri in the near future, where, Gurung said he plans to bring 5 lakh people. He further said Banerjee forms development boards for communities, but does nothing for the minorities and Adivasis. "But I have no objections; I am very happy," he said, and explained that the Lepchas and other communities may take new houses for themselves through the development board funds, "but when it comes to Gorkhaland, we are one." According to him, the GJMM will reply to the "state's bricks with stones." He said Bengal has now become 'kangaal' (empty). "There is no industry in the state, and as such, no employment. Mamata has made the state kangaal," he said. "The Gorkha National Liberation Front (GNLF) ruled Darjeeling for 22 years during the Left Front's rule of 34 years in the state, but the Left government never interfered in Hill matters. Mamata Banerjee interfered exactly 27 times in the GTA in the past three years," Gurung said. Chief of the Gorkha Jan Mukti Morcha (GJMM) and the Gorkhaland Territorial Administration (GTA) Bimal Gurung on Wednesday said his party will re-launch the Gorkhaland agitation from 2 October. Addressing a mammoth rally at the Mela Ground here, he, however, said the statehood agitation this time around will be more "Delhi-centric and democratic."